On Friday morning we leave Tonopah and continue south on Highway 95. Joshua trees dot the landscape. Twenty five miles later we come to the edge of the tumbledown, almost ghost town of Goldfield. As 95 doglegs east we begin to see signs of life. A curio shop, a convenience store/gas station, a closed restaurant, an arrow pointing down a dirt street toward a motel. When we reach the center of town we see just west a massive, stone-pillared building, the Goldfield Hotel. Farther along are the decommissioned First Methodist Episcopal church, a tourist kiosk, the granite three story Courthouse, and an old fire station with the original bays for fire wagons and horses. Its trim is still a snappy red. Stan pulls over and, through melting snow, we tour the heart of town. 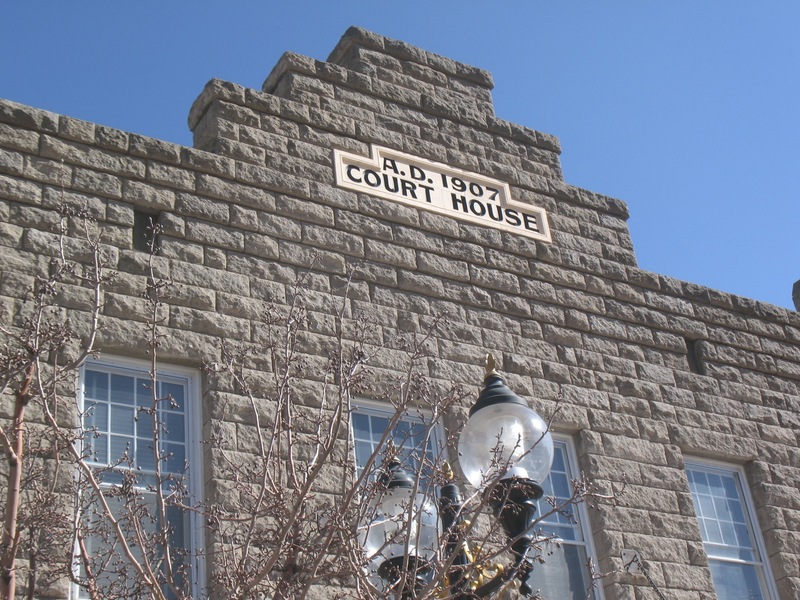 In front of the county courthouse—Goldfield is Esmeralda’s county seat— a local man and woman stop to chat about the town’s history and preservation. She’s on the Historical Society Board. The Society has produced a hefty pamphlet on Goldfield, complete with map and photos. Almost 200 locations are numbered on the map—everything from the old High School to the original site of the Goldfield News. Most are empty desert, their structures long gone. 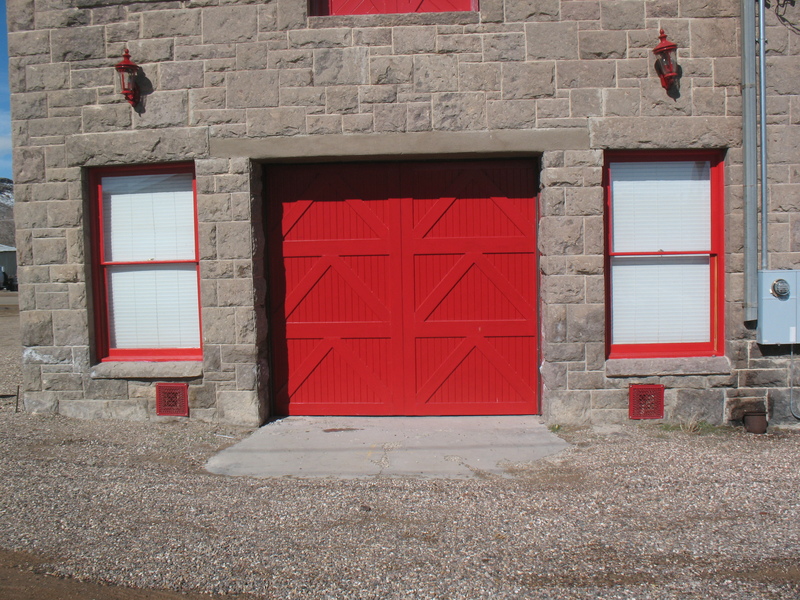 Next to the fire house (in use until 2002) is a house faced with glass bottles stuck into its stucco sides. On the corner is an understated Victorian, home of Tex Rickard, a boxing impresario who staged the longest fight on record, 42 rounds in 1906, which happened right here in Goldfield. 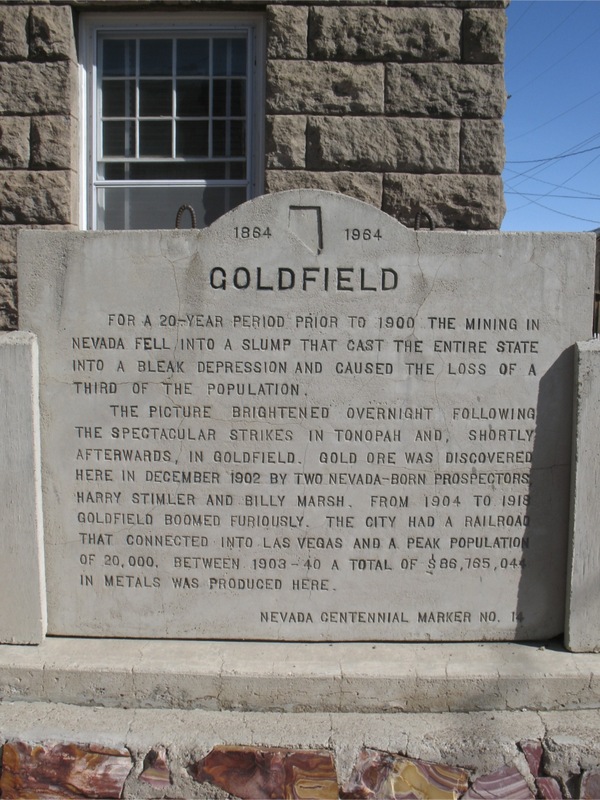 From 1903 to 1910, underwritten by huge gold and silver strikes, Goldfield was the largest city in Nevada, boasting a population of over 20,000. 2006 estimates put the population at 430, 1262 for the entire 3588 square mile County. Back home, I’m impressed by the County’s high tech website. As I nose around I think I discover why. The proposed Yucca Mountain Nuclear Waste site is right next door in Nye County. Yucca Mountain has its very own link on the website, as well as a public information office in Goldfield. Ah ha. A postscript: On March 5th, the very day we were in Goldfield, the Department of Energy withdrew its application to build and operate Yucca Mountain. 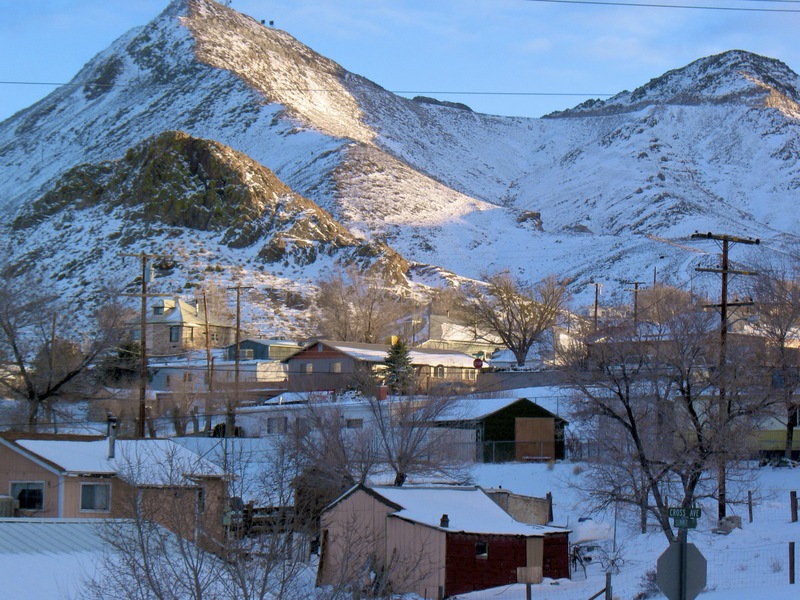 Today’s trip ends at dusk, in Tonopah, elevation 6030 feet, the piles of snow along very steep Main Street melting into what promises to become black ice tonight. 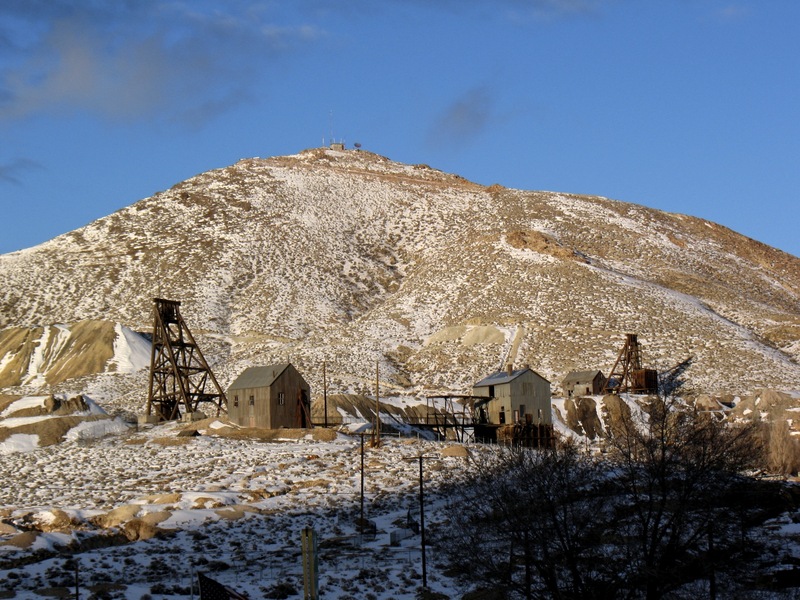 Tonopah’s original 1900 boom came as the result of silver strikes, some of the largest in Nevada history. For forty years, the “Queen of the Silver Camps” consistently produced gold and silver. But by the end of World War II, the mines were played out. These days the town is abuzz with the talk of last fall’s auction purchase of the Mitzpah and promised reopening. Nothing’s come of it yet. But a restored Mitzpah could be a real economic shot in the arm. There are just a few locally owned motels (no chains here) and Tonopah hosts many temporary workers for the enormous nearby Nellis Air Force Base and Test Range. Between the military, tourism, and jobs associated with being the county seat, Tonopah just barely manages to stay alive. I pick up a copy of the Tonopah Times-Bonanza, the town’s original newspaper, founded in 1901, still printed weekly. There are 20 legal notices of Las Vegas water appropriation applications. Hum…. Tonopah does have one claim to fame: USA Today ranked Tonopah the #1 Stargazing Destination in the US. They do definitely have dark skies, especially now that the Mitzpah Hotel’s old timey rooftop sign no longer illuminates the night sky. Still I hope the sign will be relit soon. It makes Tonopah feel like one of the last true wild west towns. Getting from Albuquerque to the Curry County coast is always a straight shot: across Arizona on I-40, CA-58 at Barstow to Bakersfield, up the San Joaquin valley on I-5, around the Bay Area to Clear Lake, and from there up US 101 to Nesika. It’s a long 1400 mile four day trip. Coming back is a different story. We usually take a more leisurely alternate route, hugging the California coast. But this return we choose a different path, crossing the northern California mountains and into Nevada. Our second night’s destination is Tonopah, NV, an old mining town midway between Reno and Las Vegas. 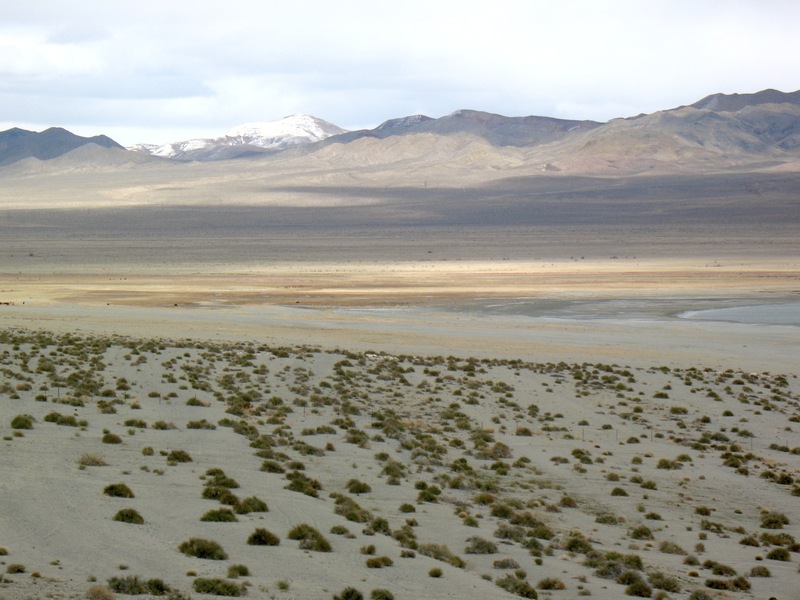 It is a lonesome day-long trip south on US 95 through basin and range country. Although signed as open range (the sign’s cartoon-like cow, unique to Nevada, reminds us of Ferdinand) we see no ranches, no corrals. We don’t even see cattle. 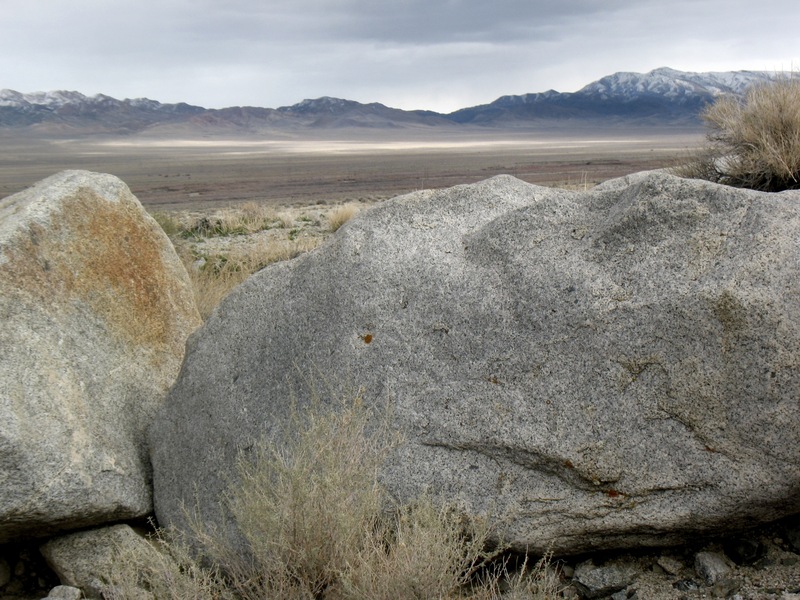 Besides ranching, gold and silver were once the economic mainstay of rural central Nevada. So its few towns have experienced the typical boom and bust, most of them busting for good in the early 20th century. Now it seems it’s the military that’s keeping what’s left alive. After lunch we come on Walker Lake, a 50 square mile surprise in this high Great Basin desert. 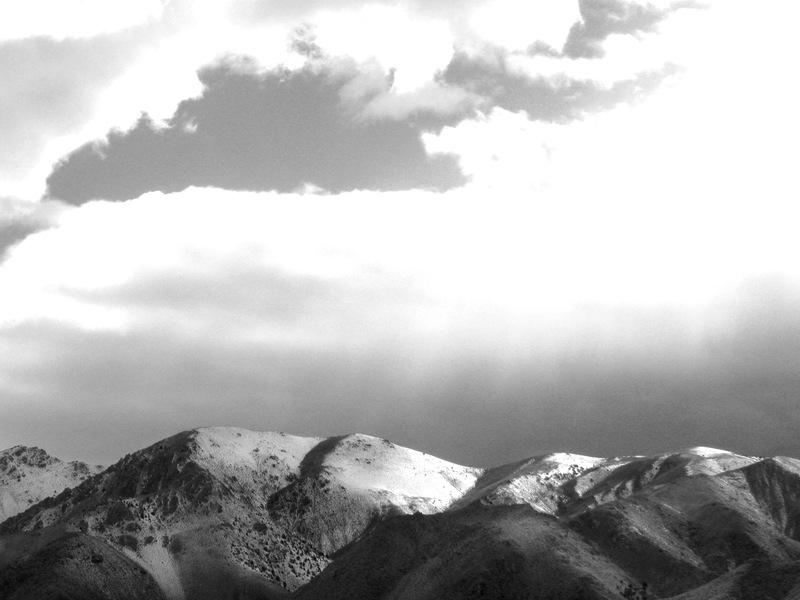 A dry mountain range topped by snow-covered Mt. Grant, elevation 11,239 feet, cups the southwest shore. 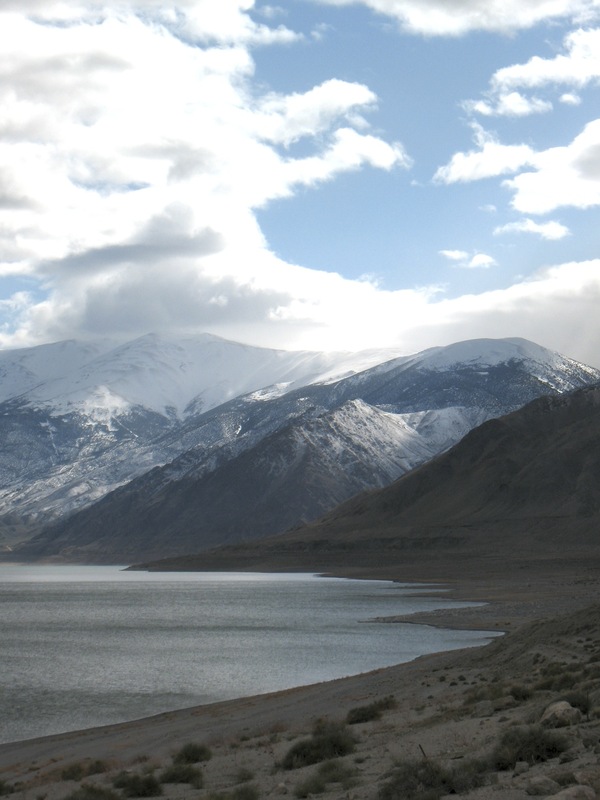 Walker Lake is the terminus of the Sierra’s Walker River and, like Pyramid and Mono Lakes, is an Ice Age remnant of giant Lake Lahontan, which covered much of central and northern Nevada. 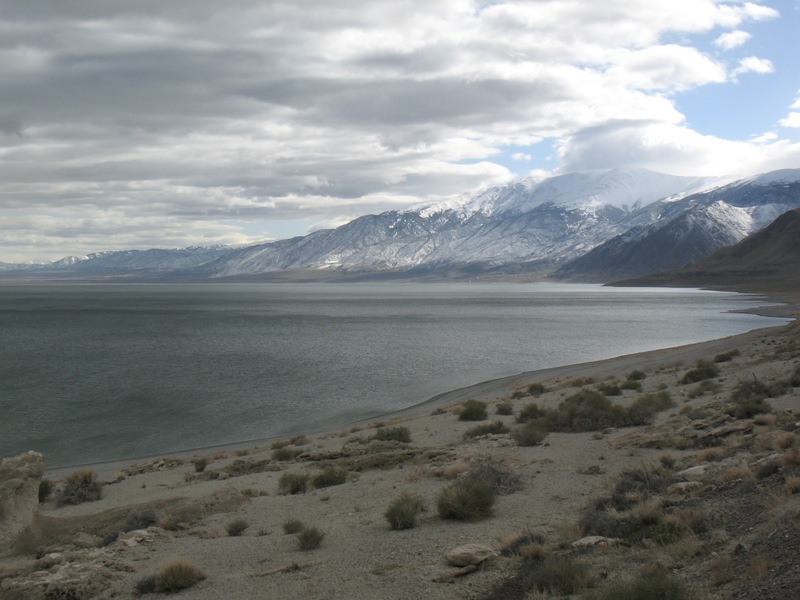 Because of upstream diversions and periodic drought, Walker Lake has receded dramatically and is now sufficiently saline to have killed off much of the original food chain, from zooplankton to fish. A local group (www.walkerlake.org) is trying to protect and preserve what remains for its threatened fish and the large populations of migrating waterfowl which land in spring and fall. We stop at Hawthorne, site of the world’s largest military ammunition plant, on the Lake’s far south side. There in the Safeway, I meet a remnant of central Nevada’s original money maker: A grizzled old prospector is loading up on beer and cheese before heading back into the hills. Next: We head south toward Tonopah.